Lick Observatory will be closed to the public December 24 and 25, but visiting hours will be extended for the rest of the holiday period. From Monday, December 26, through Sunday, January 1, the observatory will be open every day from 12 noon to 5 p.m., with free public tours available every half hour. The Lick Observatory Visitor Center includes a gift shop and exhibits in the main building. Tours begin at the gift shop and include a short informal talk about the observatory's history while viewing the 36-inch Great Lick Refractor telescope in the larger dome of the main observatory building. Visitors can also walk to the Shane Dome to view the 120-inch Shane Telescope from the visitors' gallery. Lick Observatory is located on the summit of Mt. Hamilton east of San Jose. In winter, the road to the observatory may be closed due to snow. For current conditions, visit the California Highway Information website and enter highway number 130. 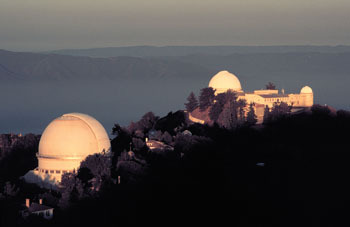 With headquarters at UC Santa Cruz, Lick Observatory is a multi-campus research unit of the University of California, providing UC astronomers with a state-of-the-art research facility.